When I began diving into the realities of racism several years ago, I committed to doing objective research. I would not/will not limit my input to sources leaning in any one direction. And so I can assure you that the conclusion of that article I’ve quoted is echoed nearly universally in any study on the subject of discrimination by qualified researchers. I chose to quote this article because it stated the conclusion in accessible English! In future posts I’ll dive into the specific realities of many of the major societal systems, using that same objective determination. This notion of privilege is particularly grating to us white folks (another time we’ll look at the notion that we’re “white”). If we acknowledge that privilege exists, we can drop into shame or guilt or defensiveness – which serves no positive purpose, and in fact delays action to reduce the effects of privilege. If we deny that privilege exists, we necessarily have to operate with cognitive dissonance – one definition: The mental conflict that occurs when beliefs or assumptions are contradicted by factual information. “When you’re accustomed to privilege, equality feels like oppression.” Biran Sims, Pennsylvania State Rep.
“I’m not saying that white people are better. I’m just saying BEING white is clearly better. I mean, if it was an option, I’d definitely re-up! ” Comedian Louis C.K. And now to my latest personal lesson in privilege: I had decided that I would block replies to this blog from Howard Eagle, a Black educator who writes searing missives when he smells white privilege. I had heard from so many (mainly) white subscribers that they would not engage here because they feared his feedback for various reasons. I’ve reversed that position because of strong, clear objections from many other subscribers, helping me see that this actually encouraged a form of white privilege: the tendency to recoil and disconnect when confronted on issues of racism. I was choosing to protect people from painful emotions but blocking them from actually learning something – about themselves and about racism. So Howard is unblocked. The cost to me personally of this awkward flip/flop is really not a cost but a gain: the loss of some ego and blindness. I encourage ALL to participate here. The original posts are simply prompters for the learning that can come in the exchanges that follow. I encourage you to be vulnerable and honest in replies. To leave a reply, scroll to the end of the page. I encourage you to sift through rhetoric and tone to glean any message that can help you learn. Also note that when you do post a comment, you can check the box indicating that you want to be informed when someone replies to you. AND: Find your place in the ACTION that’s needed to deconstruct personal, structural and institutional racism. FINALLY: If you have any particular topics or issues you’d want me to address, please let me know. Make this your blog. “Strangers in Their Own Land: Anger and Mourning on the American Right” Arlie Russell Hochschild; NYT Bestseller re understanding conservative mind-sets. If found this very enlightening. Research your own family history. Ask any elders about memories of the kinds of events mentioned in this post or the previous one. Compare notes with other people, especially any Black friends or acquaintances in your past or present. Get a subscription to “Minority Reporter” at www.minorityreporter.net. 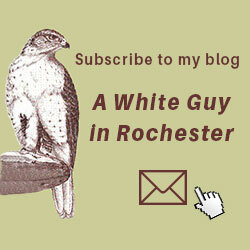 This bi-weekly publication provides coverage of issues affecting minority groups in the Rochester area. Join Showing Up For Racial Justice (SURJ) Rochester . This is the local chapter of a national organization of white people who work as allies to the Black community. They regularly publicize events for education and for supporting Black-led efforts. Let others know about this blog – through your social networks, work, family, etc. Previous post“White Privilege” – Says Who? Kudos, Frank, for reversing your position on Howard Eagle. Despite his (i guess) reputation for being less than gentle in his comments, if he makes reasoned points he deserves to be heard. So, “white” folks, fear not an inquiry into truth that admits most everyone to the conversation. But if my middle sister writes comments feel free to block her; she is one who is convinced that our current president is that answer to the nation’s problems and somehow believes everything he says. Comment: I have a good friend, a black musician and producer. He lives in Alabama. Today he was driving to Nashville…a long drive for him. He says that he makes this trip with great caution, especially in certain areas. He has long dreads, dresses well, carries a lot of extremely expensive equipment. Nicest guy in the world, but he is aware that he could get pulled over for some bogus reason, have something get damaged or worse while in some rural area. He says he knows where not to stop. As a white person, I know where not to stop in New Mexico because of crime. But Avoiding a certain area would not be because I’m trying to avoid the police. We generally have grown up with the privilege of being able to trust law enforcement. He does not have that luxury. He sticks to the larger cities or more liberal college towns if he needs to buy gas or use the restroom. Imagine how awful that would be. To have to be fearful of possible encounters. And now when I know he’s driving somewhere, I worry about him. I think he feels much safer traveling in Europe than he does here. I need to talk to him more about this, as you have suggested in the blog. Thanks for talking about this subject and doing this blog, Frank. Great idea, and there couldn’t be a more thoughtful or honest person leading us along. “Leading [you] along” — to where??? The Take It Down Planning Committee, Faith Community Alliance of Greater Rochester, Inc. MAMA (TIDPC FCA MAMA Coalition) meets at 1:00 pm on the First Saturday of Each Month @ Central Church of Christ (101 S. Plymouth Avenue — across the street from the Public Safety Building) — our next monthly meeting is July 7th@ 1:00 pm. 1. address the disconnect between Central Office-level hiring strategies and school- building-level hiring practices. 2. significantly increase actions regarding recruitment efforts at HBCU’s. 3. develop an efficient process for effectively sharing accurate, current, quantitative, and qualitative data (dash board development). 4. create class rosters that focus on significantly increasing opportunities for Black students to be taught by at least one Black teacher in 3rd-5th grades. 5. create a reliable/representative pipeline for community input and collaboration (Racial Equity Advocacy and Leadership Team — REAL)? 6. develop a process for ongoing communication between TID, FCA, MAMA Coalition & the Superintendent regarding collaboration. 7. significantly strengthen and expand the Teaching and Learning Institute (TLI). 8. create a process relative to ongoing, authentic, mandatory, anti-racist education/professional development for all RCSD employees. 9. engage a cultural anthropologist relative to developing a process designed to efficiently collect and analyze scientifically reliable, qualitative data, especially as it relates to hiring and retention practices. Thank you for initiating this much needed conversation. i have had ample opportunity to engage wealthy “white” people. Almost exclusively, they take their privilege and entitlement as a given and feel completely deserving of special attention, whether earned or not. You don’t think that the phenomenon of “white people feeling completely deserving of special attention, whether earned or not” — is limited to the “wealthy” — do you??? Nor do i think that the effects of such privilege exclusively land on people of color. When something hurtful happens to me or to someone else I care for, I tend to blame some other person or the system, but not me. It is not my problem/fault. I have to go deep inside myself and/or talk with someone I trust to see my responsibility. This attitude is entwined in racial relations and goes far beyond racial relations.